Volleys of musket fire echoed through the U.S. Coast Guard Auxiliary Flotilla 26 Base at Sylvan Beach Sunday afternoon (June 2, 2013). 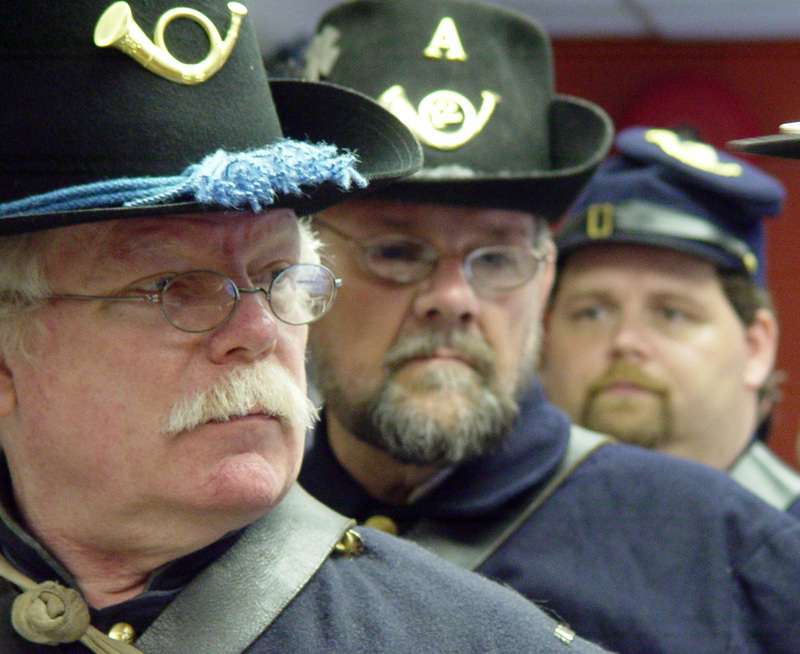 The squad of Civil War re-enactors paid tribute to the fallen men and women of the Coast Guard and Auxiliary. 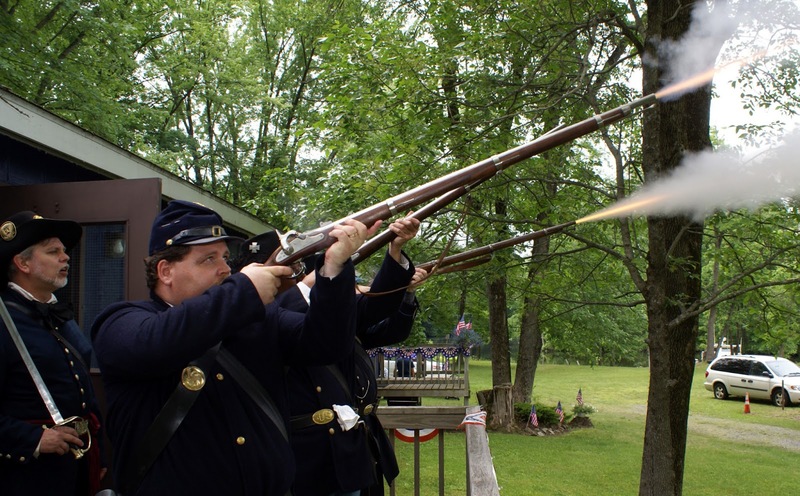 The musket fire also brought to a close annual base commissioning ceremonies, officially signaling the start of the flotilla's Oneida Lake operations for the 2013 boating season. 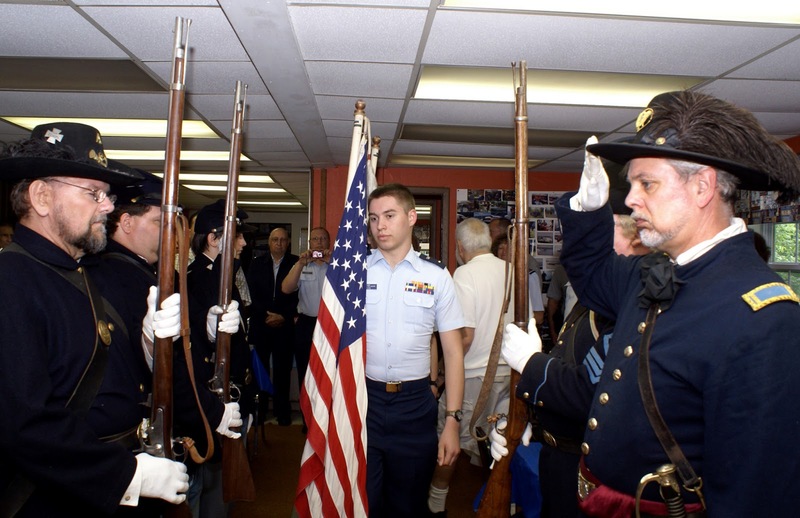 Re-enactors serve as honor guard for CAP cadet color guard. Flotilla Commander Karen Beehm of Hubbardsville said the Coast Guard Auxiliary has served local boaters for more than 50 years, responding to distress calls on Oneida Lake, making numerous safety patrols, providing free vessel safety checks, and offering "countless hours of public education on boating safety." The re-enactors from the Syracuse-based 12th Infantry living history regiment also helped to open the ceremonies by escorting Civil Air Patrol cadets from Utica Cadet Squadron who presented the colors and stood at attention during the playing of the national anthem and the Coast Guard anthem, "Semper Peratus" (Always Ready). Flotilla Vice Commander Bill Cummings of Utica introduced the cadets and re-enactors, along with special guests that included the Oneida County Sheriff's Marine Patrol, BM2 Walter Kendall, a coxswain and law enforcement Coast Guardsman from Coast Guard Station Oswego, and Coast Guard Auxiliary Division 2 Acting Commander Rick Kunz of East Syracuse. The Civil Air Patrol -- the search-and-rescue, cadet mentoring and aerospace education auxiliary of the U.S. Air Force -- has participated in the Coast Guard Auxiliary base commissioning for the past decade, noted Capt. Paul Kulesa of Utica, who escorted the color guard cadets, Cadet 1st Lt. Anders Hansson of Rome and Cadet Airman Benjamin Miller of Vernon. "It's part of our community service," Kulesa said. Plus, "we believe in inter-service cooperation." The Civil War re-enactors included Capt. Jim Hurd of Oneida, First Sgt. Neil MacMillan of Syracuse, Pvt. Shane Camp of Perryville (Canastota), Pvt. Harold Reichard of North Syracuse, and Pvt. Nathan Bowers of Syracuse. Joining them were three women dressed as spouses of 12th Infantry soldiers. They were Shantille Camp of Perryville (Canastota), Jan Reichard of North Syracuse, and Peggy Reilly of North Syracuse. The re-enactors saw their participation as a way to "show our respect and appreciation" for those who are serving community and country today, noted Captain Hurd.